Pina Bausch was an Alice in Wonderland, observing people and social rituals with a curiosity both child-like and sardonic. For her, everyday behaviour was peculiarly exotic: her company’s residencies in farflung parts of the world simply added local colour to the typically Pina ‘pieces’ she mounted on stage. Her concerns remained much the same: the way people present themselves, to each other and to the watching audience, the games they play, their hypocrisies and fantasies. So when we know that Ten Chi, for example, was inspired by a visit in 2004 to a Japanese city, Saitama, we really shouldn’t expect a portrayal of a culture. Her designer, Peter Pabst, created a poetic setting that cannot have evoked sprawling urban Saitama, not far from Tokyo and nowhere near the sea. A whale’s tail flares upwards, its back suggested by a hump further upstage. White particles fall continuously from 45 minutes into the piece: snow, blossom – atomic ash? It’s far too tempting to assume that Bausch and Pabst were commenting on Japan’s insistence on killing whales; or the ecological frailty of its islands, or alluding to the snow that falls in Kurosawa’s films or in Kabuki dramas. (A tragic solo, performed at our National Theatre by a famous onnagata performer, depicted the heart-broken heroine dying exquisitely in a snow storm.) But just maybe it was snowing when the company visited Saitama; maybe jet-lag accounted for the dreamlike atmosphere and the sense of desolation. Ten Chi apparently means Heaven and Earth, and the opening sequence has a tiny dancer (Ditta Miranda Josifi) suspended as though swimming or flying, supported by an ‘invisible’ figure in black. She is joined by other women in long bias-cut dresses, hair flowing, poised on the backs of men in suits. Gravel-voiced Nazareth Panadero discourses on the need for sleep, after she has indulged in a fetichistic striptease. Dominique Mercy performs a wistful solo in a long velvet gown before conducting a snoring session with the front row of the stalls. Musical accompaniment ranges from a plinking koto harp to noisy jazz or plaintive songs. Every now and again overtly Japanese references erupt. Helena Pikon clutches a hot-water bottle while listing the research trips the dancers undertook in Saitama. She assumes the guise of an apologetic Japanese tour guide with a back-pack, trying to hurry her charges along. A cute girl harasses a baffled man by taking incessant photos of him. Mechthild Grossman makes a cabaret turn out of her basso pronounciation of familiar Japanese words – karaoke, sushi, samurai. A besuited‘business man’ lasciviously recites electronic brand names. Azusa Seyama delivers lessons in correct ways to bow, smile and sit to impish Josifi, who breaks free to dance exultantly in the fallen snow. Prominence in Ten Chi is given to ten of the women in the company who dance most of the solos. Some appear modest at first, twisting their wrists in oriental gestures; others emulate Bausch’s signature undulating arms; others are boldly sensual – Regina Advento in red satin, Julie Shanahan and Azusa Seyama in slinky white. Nazareth Panadero claims centre stage as a self-absorbed diva in pink. The men are assiduous, providing the women with props and chairs, lifting them up or serving as playfellows. Manfully, however, they ignore Grossman (in a mad hat beneath the whale tail) when she tries to interest them in a new star in the sky. Things turn perverse in true Bausch fashion. A Godzilla woman, hair hanging over her face, punches a pillow and pulls a man to her with a table cloth, threatening to devour him; she challenges him by removing (rubber) snakes from inside her handbag and twining them round both their necks. Helena Pikon takes a ride on a man covered by a bear rug. Regina Advento vamps two men, thwacking them with a tulip. Azusa Seyama stabs herself with a lighted cigarette; a small woman proceeds to stamp on broken glass, upstaging tall Julie Shanahan, who’s been attempting to hold the audience’s attention. When the younger men do get a chance to dance their choreography is closer to martial arts or breakdancing than the sinuous moves of the women. Two men, hair gelled into coifs, pose as modern samurai. Mercy has an extraordinary ritualised solo in which he is first disrobed of many garments by a male attendant, then formally dressed in a dark suit. He is galvanised into a warrior stomp, hands on knees, before huddling down in despair or frustration, a lost soul leaving temporary traces in the snow. 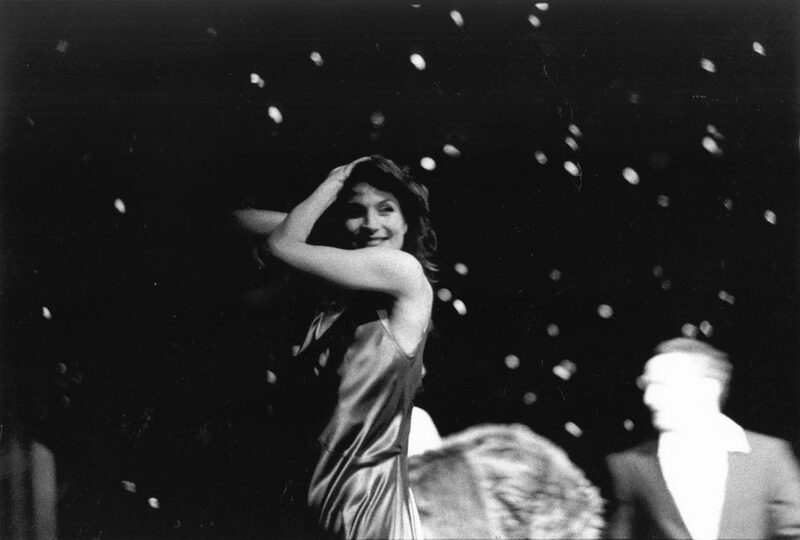 While Bausch’s timing of contrasting sequences, slow, fast, sad, silly, can be mesmerising, I became rather too aware, as time passed in the second half, of each member of the cast duly being given a solo spot, some belatedly. Whose turn next? Who’s going to reprise an earlier number or strike out in a new direction? Unusually, there is little ensemble work in Ten Chi until a noisy near-finale of flying figures, men brandishing their ties as they run to catch screaming women. It seems inevitable that the piece will end as it began, with Josifi swirling between heaven and earth as the light fails and the snow (or is it blossom?) continues to fall. Ten Chi is like a musical composition mostly in a minor key – an accumulation of moments and motifs without a strong sense of purpose. In fact, much of the recorded music seems half-heard in sleep. There’s a pervasive feeling of melancholy, of a culture beyond comprehension except in crass tourist terms. Grossman and Panadero, growling platitudes or incomprehensible gobbets of text by Brecht, Buchner and other non-Oriental writers, presumably represent Western culture at sea in Japan – or perhaps anywhere. They, we, are all lost in translation.